After a couple of weeks of crazy fire sale like discounts (40-80% of everything some below cost) I went to my local MD's at Warringah Mall yesterday and they are closing down on Wednesday. It's sad but true. Some of their older gear was fantastic and now they sell trendy flannels and heavy sleeping bags that aren't functional at all. They sell a $600 Gore-Tex jacket for skiing that wont even allow you to fit a helmet under the hood for *&^%$# sake. Rick White would be rolling in his grave. Only thing I picked up from a MtD store was a golden emergency blanket, because it was golden not silver. I had a great time working part time ( whilst at uni) in MDs in the early 80's, when gear design was going forwards at great speed, and MDs were right up there with some really great extremely well designed gear. And, yes, they've now gone for the fashion brigade......as have Kathmandu, but the latter seems to be going OK ( yep, none of us would ever pay full price at Kathmandu), but Kathmandu have seemed to have produced a middle of the range "brand", which perpetuates them. Whilst I make most of my own gear these days, I would source anything else from cottage manufacturers, as I'm after minimal weight high end stuff, and none of the locals sell much of that now. Sad to see them go, I used to keep an eye on their clearance range and picked up some sweet deals for work clothing. Some cheap thermals and equipment currently. Just bought 5 of their Super Dry 16 1/4 Zip tops, wont be Arcteryx quality, but good whilst renovating the house . kathmandu have always been a brand for the mainstream population, backpackers, travellers.... and now casual wear, they are well established in a market they have always been in. are you able to market yourself effectively for that market and take the market share in the new market? kmandu were making more specific alpine gear in the past but moved away from that to stick to their original knitting. It may be a bit soon to assert that Mountain Designs are closing down. The story posted in the OP is behind a paywall so I cannot read it, but of the two stories I can find in the Courier Mail (both published in the last two days), one says Mountain Designs is closing 13 of 39 stores. The other reports on the company's accounts, but also explicitly states that "The company is still operating and not in administration." I think the criticism of MD is unfair. The climbing and bushwalking market in Australia is small. Any company both manufacturing and retailing in this market has no choice but to diversify into the travel market or perish. And on the solely retailing side it's not hard to tot up a list of operators that have already closed the doors. Try to naming another Australian company (or any company for that matter) that is both a manufacturer and a national bricks-and-mortar retailer to only the bushwalking/hiking/climbing market. And then of course Rick White's former climbing partner (Tim Maccartney-Snape) started his own gear company (SeaToSummit), and has managed to achieve global market penetration while avoiding running a retail operation, which effectively cut MD out of these markets. And not to forget that MD has been broke before, when Rick White was at the helm, and that saw him forced out of the company for a long time. My wife and I have been associated with the trekking/climbing world for thirty years and through industry discounts have accumulated an immense amount of gear from many different manufacturers. We have quite a lot of MD gear which we still use to this day and have had few issues of any kind with any of it. Actually this applied to several items for which I paid full retail and had to return for refunds. RonK wrote: It may be a bit soon to assert that Mountain Designs are closing down. Word from the Kent St staff is that a majority of the staff have been given the flick, with only 3 being kept on to close the store out. Looks like the regional and suburban stores are closing quickly, the flagship CBD have a month or so left, online a few months. Still unknown if MD's have been or will be sold and come back as "new" MD's, a new retailer or the brand joining a established retailer range? I went into a regional store yesterday. Stock is being cleared pretty rapidly (it looks like they are closing down to me) and there are bargains to be had. Not all their gear is poor quality but, admittedly, some is bizarre ( a wool stuffed puffy? - it's as heavy as it sounds....). I felt like a vulture picking a carcass clean. Tend to agree with RonK's point that Mountain Designs had to get into the travel market. Serious bushwalking/climbing market is not big enough to sustain several chain store operations. I just hope Paddy Pallin is not next. I love that store/brand. For my 2 cents, what killed (or is killing) Mountain Designs is the Australian online stores (and to lesser extent the overseas ones). Online stores offer 2-3 day shipping (usually) and huge variety of stock at heavily discounted prices. It’s hard to beat. Plus, you have newer entrants like uniglo which make great outdoor and travel clothing and they sell them cheap. And lets not forget allot of casual bushwalkers shop at Kathmandu. I subscribe to a number of Australian outdoor retail store newsletters and its obvious they are all struggling. Every week there is a sale on. It’s just dam hard to compete with online. I admit I do buy online but I also frequently buy from the bricks and mortar stores such as Paddy’s and occasionally MD, Macpac, Trek and Travel and Mountain Equipment. I don’t mind paying a 10%-20% premium for some things as I find the service especially at Paddy Pallin and Mountain Equipment to be excellent and it’s great to be able to try things on, make sure they fit etc. a)	Work out a way to get rid of the wholesaler/importer and negotiate direct with the manufacturer. Been in the Blueys a lot last year and really like Paddy's there. Is some kind of partner/franchise setup. I tend to cruise the gear shops if they're around, but quickly didn't bother with MD or Macpac. I keep getting 'end of year sale' emails from MD. Prices are now accurate ie T-shirt two for $10, thermals two for $50. Went into the kent st store today in Sydney. Sure looks like they are closing down. Pretty much everything is atleast 50% off. The store is being picked clean. But youd want to be quick to get stuff in smaller sizes. Mostly larger sizers remain. There are some suunto watches still there (50% off) not many but if your quick pick up a bargain. wildwanderer wrote: There are some suunto watches still there (50% off) not many but if your quick pick up a bargain. Picked up a Suunto Core for $140, normally $350. Also picked up a Black Diamond Cosmo for $26, normally $65. Last time I was in an MD store must have been 15+ years ago. Even then I got the impression that they did not know what market they were aiming at. Everything was $$$, and they seemed to be trying to sell last decade's heavy-weight gear into today's lighter-weight market. Ah well. Paddy Pallin Jindabyne closing next weekend!! I never thought that they shouldn't cater for tourists and travelers, that is a big market and usually highly profitable but you can do that and still not abandon the core market that gave the name its reputation in the first place. My own problems with the brand was simply the fit of the clothing combined with poor design in the small detail. It went from a generous sizing with broad shoulders, decent back length and long sleeves to fit Australian bodies to the typical Chinese factory fit of short arms and short body length and the brands XL was really a medium because they made no allowance for layering when sizing the stuff, this says to me that the people buying and designing the clothing were no longer skiers and climber or walkers and to me that is the definition of abandoning your core market. The same thing has happened to The North Face and other conglomerate brands. People criticise heavily and unfairly and they quickly forget that Australia is not the US, UK, France or Italy. For heaven’s sake we don’t have serious mountains here let alone this activity being more mainstream like in Europe or North America. Australia is way more associated with surfing than rock climbing. Most people in Brisbane never hear of Mt Barney!! Ask a Swiss or an Italian if they know what the Matterhorn or Cervino is? They even are likely to tell you who was the first ascent party. Australia tho is VERY close to the highest and toughest mountain ranges in the world and those of us who dreamed of high, cold. white places used to go to the original MD stores and drool over the gear that used to be made. My old Everest duvet is still one of the best climbing parkas ever sewed up and I bought it over 30 years ago. Only your old jacket? How about everything else? 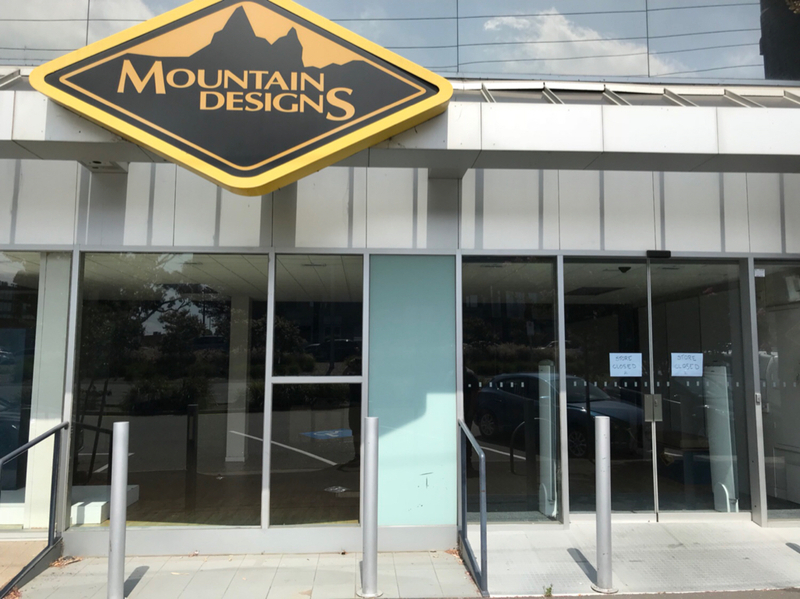 Mountain Designs in Moorabbin now gone. It actually makes me quite sad. I’m going to brave the heat today and head to the CBD store to see if there’s anything worth grabbing. I wouldn’t mind betting they’re all going to close eventually. MD in Birkenhead Point (Sydney) is still well stocked at present. No sign of closing down just yet. Not sure what its future holds. The Little Bourke St store in Melbourne was looking pretty sad when I went in last week. Upstairs was almost empty, and downstairs was full of handwritten signs, "2 for $20", "S2S sporks, $1.50 ea" etc. Yeah the Melb CBD store is closing for sure. I grabbed some Keen shoes (last of my size of any shoe in the store) for $75 down from $220. My girlfriend grabbed a sleeping bag, mostly for car camping, for $167 down from $420. Great savings but it’s sad to see happen. They still looked to have a fair range of hard shells. Oh I grabbed a Muncher tool as well. Pretty cool little gadget.